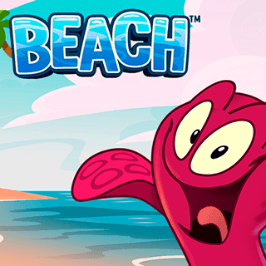 Everyone loves a day at the beach, and while this slot from NetEnt might not be able to bring you sun, sea and sand, it does arouse some of the sights and sounds of a typical day by the seaside. Plus you can win much more money than you can on a 2p machine at the seafront arcades. This slot title has been around for a few years now and remains hugely popular on many of the leading online casino sites. We hope that by the end of our review, you’ll almost be able to smell the sea air! 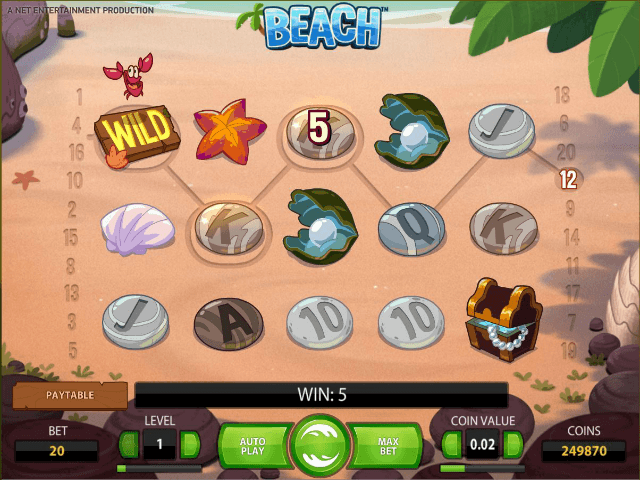 The first distinctive thing you’ll notice about Beach - other than the fact it is not the famed Beach Life slot - is that instead of the normal spinning of reels, waves throw the symbols onto the screen. The symbols stay true to the beach theme, too, with objects such as seashells, pebbles and starfish. It’s a beach theme in the natural sense as opposed to the clichéd images associated with the British seaside (candy floss, donkeys, saucy postcards and all that). In the background there’s the soothing sound of the waves gently lapping against the shore and birds tweeting, in contrast to the irritating soundtracks that accompany some slot machines. This makes for a pleasant gaming experience and overall the look and feel of the game is modern and clean! 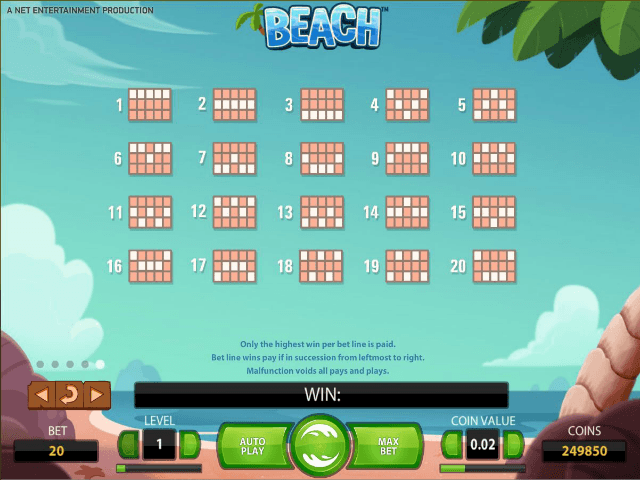 Beach features a classic layout of five columns and 20 paylines and is played with bet levels of 1-10 and coin values ranging from 0.01 to 1. The minimum bet is 20 coins and the maximum is 200 – in other words, your stake can vary from 20p to £200. All you have to do is select your bet level and your coin value, and away you go. To speed up play, there’s a ‘max bet’ function which plays the game at the maximum bet lines, highest bet level, and the current coin value. Landing on five treasure chest symbols means you win the jackpot. There are three bonus symbols in Beach. The Octopus Wild symbol can only appear on the third column and substitutes for all symbols except Scatters and Wilds. The Octopus Wild boosts your winnings by swapping around any two symbols in adjacent positions in the second, third or fourth column (excluding its own position) to create the highest possible winning combination. What’s more, all Octopus Wild wins are multiplied by two. 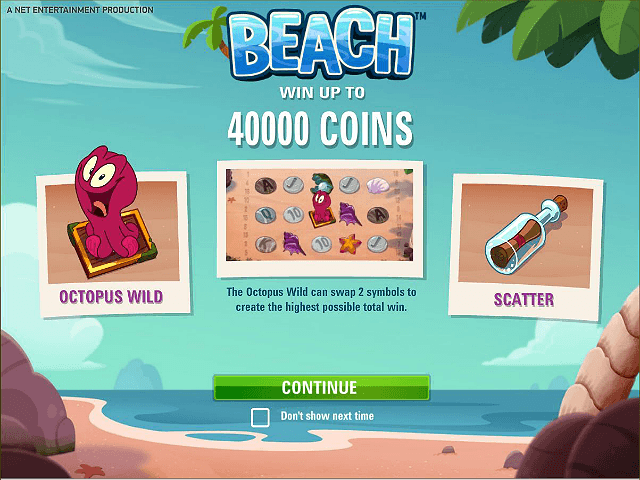 The Scatter symbol in Beach is a bottle with a message in it and in this slot game, it brings good news. Three or more Scatter symbols appearing anywhere in the main game unlocks free spins, or Free Waves as they’re called here. Three Scatter symbols equals eight Free Waves, four equals 16 Free Waves and five gets you 24. Finally there are the Wild symbols which substitute for all symbols except Scatter symbols and the Octopus Wild. These can appear anywhere during gameplay as long as they aren't apart of the third column. If you ever need reminding of the game’s features or you want to see what the different paylines are, you can click on the ‘Paytable’ button which opens up all the information you need. 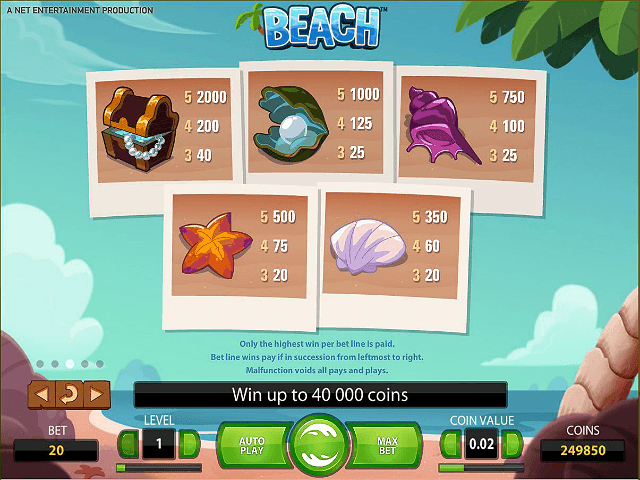 So, if you’re looking for a game that’s a bit different with plenty of free spins on offer, head down to the Beach with NetEnt. If you like Beach - You'll like these slots too!